The future and what it holds can mean something different for everyone. The coming year of 2018 for breweries can mean something different from each and every one out there as well. It could mean opening, expanding, developing, broadening, re-thinking or changing strategy, or a plethora of other aspects with each business model. Here is a look at some breweries and their look toward 2018. This past year has stacked up pretty much exactly as Chris Herron, the CEO of the Athens, Georgia brewery Creature Comforts, thought. The brewery Herron spoke of is currently in construction and the 40,000-square-foot facility with an $11 million price tag will give a significant increase to the brewery’s capacity and provide Creature Comforts with a much more advanced brewing operation. According to Herron it will be “top to bottom” with a focus on quality control with an upgraded laboratory. “We are extremely excited to be able to do a better job of keeping up with the growing demand in our home market,” Herron said. In addition, the current on-site taproom for Creature Comforts in Athens, and across the state for all Georgia breweries has changed a lot as the state laws changed on September 1 to allow breweries to sell beer directly to consumers for the first time. The brewery is making sure to “keep it in the family” despite the steep price tag for growth without selling out to larger macro brands. “Even minority investments generally come with a path to full ownership from the large multinationals,” Herron said. “We believe that no one can create a better environment for their employees, or grow a brand for long-term success as well as BA-defined craft breweries. Clement Pellani, a co-founder and the COO for Stratford, Connecticut’s Two Roads said the biggest change for the brewery moving forward is the implementation of pricing managing software to help assess various price strategies and see the impact on case sales and margins. With the upgrade in technology, Two Roads can scenario plan by market by looking at how various price and promotion strategies work for the consumer and the complete three-tier network. “As we use the solution over the next year and in the future, the data history builds which enables us to see how past price changes impacted volume and revenue, and by integrating with our internal accounting we can also assess the potential impact on margin,” Pellani said, who added he could envision the brewery increasing the number of price tiers that they have in the market and optimize the number of targeted short-term price promotions for each market. 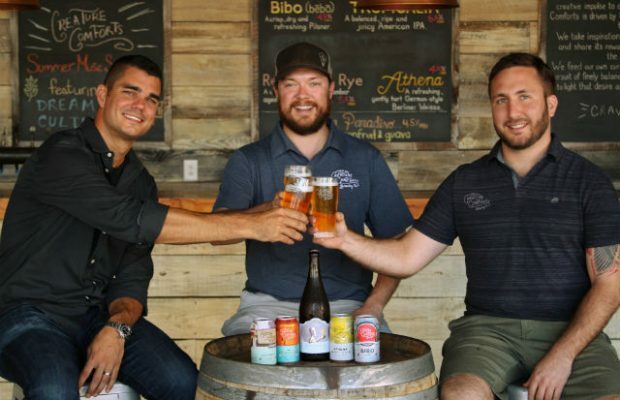 As multinational conglomerates continue to dip into the craft market by purchasing parts or all of smaller breweries, some of those breweries have decided to team up. It’s already happened with Southern Tier and Victory Brewing teaming up to form ABV (Artisanal Brewing Ventures), for example. Announced in July of 2017, and with action beginning in January of 2018, 21st Amendment in San Leandro, California, and Funkwerks in Fort Collins, Colorado will partner with Brooklyn Brewery with a shared platform for sales and distribution nationwide. “We believe this is a different way for independent craft breweries to share resources and better compete in a changing craft beer market,” said 21st Amendement co-founder Nico Freccia. Creating a shared platform with complementary brands and package types just seemed to make sense on so many levels, he noted. “In a nutshell, our view is that the current ‘standard’ way smaller craft brewers produce beer, build brands with distributors and staff and sell in the field is challenged as a model for long-term growth,” noted Brooklyn VP of Business Development Dave Duffy. “The market control of the larger breweries and their new craft partners, in all tiers, is growing every day, so scale becomes more tactically critical than ever. By combining two East Coast sales teams from Brooklyn and 21st Amendment, Freccia feels it gives all three breweries a better chance to cover smaller areas allowing for more time to be spent in each market. “Because of Brooklyn’s strength on the east coast, we expect that the 21A brands will flourish with the added sales focus,” Freccia said. Out West, 21st Amendment can provide both Brooklyn and Funkwerks access to its West Coast networks which will make the opening of new markets much smoother for them. For Funkwerks co-founder Brad Lincoln, he called it an ideal situation. His brewery just passed 4,000 barrels in 2016 and was seeing even more growth on the horizon. Brooklyn Brewery has seen success at creating brewery partnerships internationally, so it made sense to do so in the US Duffy said. Several years ago, he said that the brewery began talking to lots of beer industry players about building a platform of independent, like-minded, and complementary breweries that can create scale to help solve for the biggest challenges in each tier: brewing and logistics efficiency, execution share of mind with distributors, and having measurable impact with our chain and independent retail partners. “Lately we’ve heard a lot of negative press about craft beer: trends slowing down, closings, geographic pullbacks, layoffs … “ Duffy said. “We’re proud to say that the three of us are growing volumetrically and are 100 percent bullish on craft beer. We’re here to stay. Since we already have an international sales team and distribution network in place, executing future domestic and international expansions for all three of us becomes relatively straightforward. Even though it may be a train building steam, Lincoln said that the continued slow growth is still a process that Funkwerks, which opened in 2010, plans to do. Immediate plans include expanding fermentation capacity and investing in a new bottling line to improve quality and shelf stability to prepare for a wider territory, and that will take some time he said. “We’re not going to go out and buy a brand-new shiny brewery or anything along those lines. It’s still going to be Funkwerks,” Lincoln said. “We do plan on territorial growth in 2018 but it’s going to be methodical. We aren’t immediately going to expand into all 38 states that Brooklyn and 21st Amendment cover. We are going to pick and choose outside states that make sense for our brand and with Brooklyn’s sales team, it will be a lot easier for us than it has been in the past. As Highland Brewing in Asheville, North Carolina looked forward to the new year, something had to change. Brewmaster Hollie Stephenson accepted a job to work at the new Maryland outpost for Guinness. Something president Leah Wong Ashburn said wasn’t in the plan. After shedding some tears and wishing Stephenson well, the veteran brewery that helped kickstart craft beer in the Carolinas had to shift course. Foregoing the thought of hiring another Brewmaster to come in, instead Ashburn said a collaborative effort from the brew team has taken place. “What has happened has been incredible,” she said of her staff rallying around each other in a collaborative effort. “As big of a shift as that is, we have some other folks interested and capable to contribute to the creative space that a Brewmaster would fill. Now we have a few people in three different departments and we are finding that giving them that space and collaborative effort is giving us a bunch of fresh eyes. They are already having great ideas with pilot brews where we are already getting that ‘Wow’ factor and excitement for what else this team can do. Highland made a year-round shift under the guidance of Stephenson, who arrived in early 2015 from Stone, during 2017 but Ashburn said it’s been amazing and the brewery looks toward 2018. “We ask ourselves if we need to make more changes or look to other areas to develop and the answers are yes all over,” she said. “We are doing it all with much more confidence and much sooner than I thought.